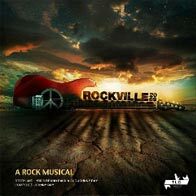 It takes more than resolve to write a rock musical of epic proportion. It requires a deep-seated passion. From an early age, nurtured by a musical family, I was drawn to anything that required creativity and artistic expression. I soon learned to play several instruments and by the age of 16, I was composing music. While I seemed destined for a career in musical theatre, my life changed direction and songwriting was relegated to hobby status. A few years ago, I got to a point in my life where I realised that it is better to have no regrets. I made the decision to follow my true vocation and with my family’s support, I embarked on my Rockville 2069 journey. The first step was to contact my school buddy Bruno. I was always comfortable with composing music but felt that it would be better to collaborate with a likeminded partner on a project of this size. Bruno and I shared a vision of inspiring positive change through music. Even though we are both products of the peace and love revolution that took place in the 60s and 70s, it took about a year to develop a concept based on the Woodstock Music and Art Festival of 1969. 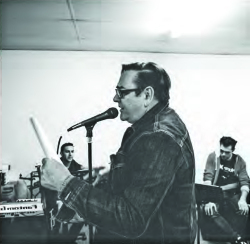 Once the idea took root, we began writing and composing in earnest and it took us another year or so to develop the basis of our rock musical. The script also trekked throughvarious processes. Justin Wilkinson helped us to develop the initial script and it was nurtured further following invaluable feedback from several well respected musical and theatre directors. To produce the final version, I followed the advice of totally deconstructing the script and reassembling it to ensure that every part of the story was covered by an appropriate song or musical moment. We were so thrilled with the result that we decided to also express the story through a graphic novel accompanied by a CD. This allows a person to read the story and experience it visually while listening to the songs. 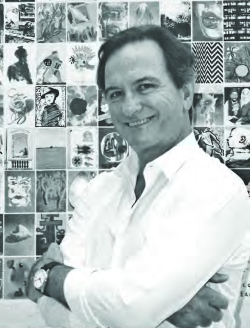 The illustrations were developed by talented Capetonian artist Leandro Van Der Westhuizen. The arrangements were completed jointly with Kyle Petersen who assisted in compiling our demo. Thereafter, I approached Darryl Andrews to adapt our arrangements and score the music. We decided to follow the route of recording a concept album as a forerunner to the staged musical. Enter the very talented Andrew Ford – a Musician, Composer and Sound Engineer at the Nut House Recording Studio. Our 22-track album took two years to compile in partnership with over 60 artists and musicians. This was then submitted to two record labels, EMI and Next Music. Both said yes and we began to bring these products to the market. After launching the CD, digital album and graphic novel, we moved onto the adaption of the stage production. I needed a director who was prepared to take that arduous road with me and was fortunate enough to find Gavin Wright, a pioneer in Musical Theatre Development. While the story remained constant, we had to delve deeper into the expression of our characters. After 6 intense months, we were ready to book our Artscape venue and The Cape Philharmonic Orchestra. Our 28-part musical grew to a 50-part score with an expanded vocal arrangement. This was the Everest! Exhausted by the challenge, I contacted my good friend Dr Steve Muir (Music) and asked if he or someone else could work with me on these orchestrations. He recommended the musical genius Stephen J Wright, who flew to Cape Town and got straight down to business. He has produced the most amazing orchestrations that will play around the world for a long time to come. The final step was to get costumes, set design, graphics, technology, our fabulous cast, The Kyle Petersen Band and Cape Philharmonic Orchestra primed for action. Finally on the 45th anniversary of Woodstock 1969, the premiere was held at the Opera House – Artscape, Cape Town on the 29th August 2014. The Festival at Woodstock was ostensibly about the opposition to Vietnam, but the philosophical position was equally about an opposition to climate change. Today we know for a fact that glaciers have shrunk, ice on rivers and lakes is breaking up earlier, plant and animal ranges have shifted and trees are flowering sooner. Effects that scientists have predicted in the past would result from global climate change are now occurring: loss of sea ice, accelerated sea level rise, longer, more intense heat waves and, paradoxically, more snow being dumped and longer winters. Dylan said in the ‘60s that “the times they are a-changin’” and this is apparent not only in a political and sociological sense, but in terms of climate impact directly. We are the generation that can do something about it straight away and music can bid us all in this endeavour. Inspiration for the dialogue and lyrics for Rockville 2069 came directly from the culture and the parlance of the 60s. The decade was a watershed moment in history and it is only with hindsight one is able to see this. The effect of the events of the time on, inter alia, world views, culture, music, literature and mores, was dramatic and caused seismic shifts which are still with us today (and, in my humble opinion, will still be with us in 2069). The post-war generation had grown up with continual conflict somewhere in the world and the turmoil that manifested itself in Indo-China, in Africa and in South America in the 60s led to wide-spread demonstrations on both sides of the Atlantic as young people called for a kinder world than the one they had inherited from their parents. The spirit of civil unrest and disobedience is palpable in the events of the musical but so is the desire for a calmer, more nurturing world, although the focus is more on the catastrophic effects that climate change will have on the world if we don’t do something about our cavalierattitude straight away. For all this, Rockville 2069 is not meant to be preachy in any way, but rather is hopefully a great entertaining night out with dancing and singing …and a message of peace and hope for the world thrown in for good measure. How appropriate are the words “Stop the War” right now, the words chanted by the hipsters at Woodstock. Now, when the world sits on a knife-edge and the Balkans and the Levant burn. Sure the context in 1969 was different, with youngsters being shipped off to Vietnam to fight a proxy war, but the sentiments are identical. War seems to have been the constant backdrop to the twentieth century. Right from the war to end all wars to conflagrations in various places around the world today, there has been constant carnage. And somehow it is left to the youngsters to try to change things as politicians sit on their hands for fear of offending voters. Woodstock was primarily about that impetus. It was about young folks having the moral courage to expose the bankruptcy of politicians and their fascination with the military-industrial complex. This same impetus influenced the demonstrations in Warsaw in 1956, Paris in 1968, Prague in 1968, Tiananmen Square in 1976, and Cape Town in 1989. The Arab Spring was a further manifestation of this sense of political impotence that politicians were displaying. No longer is the young electorate prepared to put up with the lack of delivery by elected and unelected politicians. Again, it is the youth, admittedly using different ways of operating from their counterparts 45 years ago, that are providing the moral backbone to the world. Where are the statesmen and stateswomen, the moral leaders of the world? Where are the public intellectuals, providing thoughtful guidance? Where have all the young men gone? Where have all the flowers gone…?